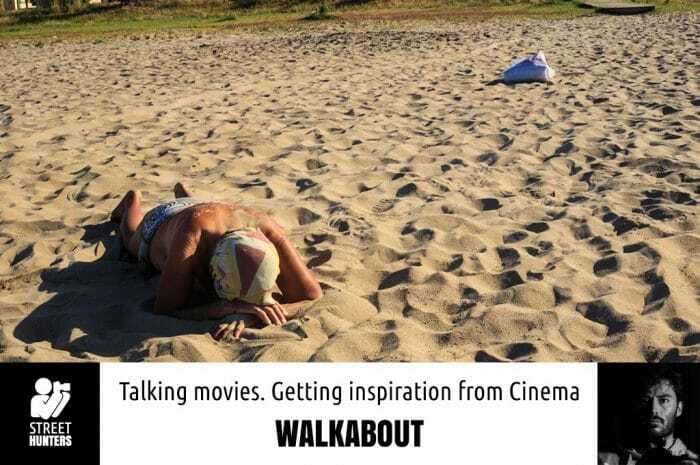 Talking Movies this week is going to analyse low-key cult ‘70s movie Walkabout. I am going to select two scenes from the movie and examine them, highlighting the ways in which the director has arranged his shots for maximum visual impact. I’ll then look into how visual techniques from cinema can be applied in street photography, to maximise the creative and compositional power of your street photography. I’ll also show a photograph of my own to go with each scene, and compare and contrast the differences between my shots and the movie scenes to explain how examining movies has influenced my street photography. As always, the complete collection of the Talking Movies articles can be found on the blog section of the Street Hunters website. Talking Movies makes another return, and this time I’m aiming almost as high as you can get! I’m casting my photographer’s eye over a movie that is regularly regarded as one of the finest pieces of cinema ever. 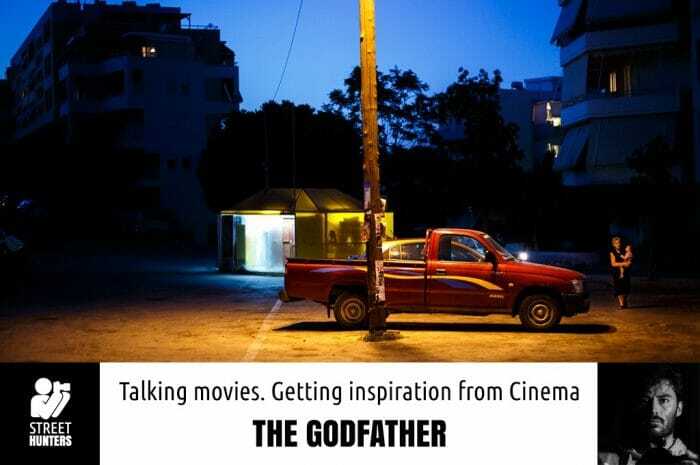 I am talking about a cinematic epic that is the daddy of all daddies, or more accurately, THE GODFATHER! This Talking Movies series shows you how you can take inspiration from some of your favourite movies (or even some you may not have come across before) and use it to further your street photography techniques when you head out shooting. This week I’ll choose two scenes from the movie to analyse, and I’ll compare them with two of my own photos to examine the similarities and differences between the shots, and describe how the movie has influenced how I shoot. As usual, you can visit the Talking Movies section of the site for a complete list of all previous articles. 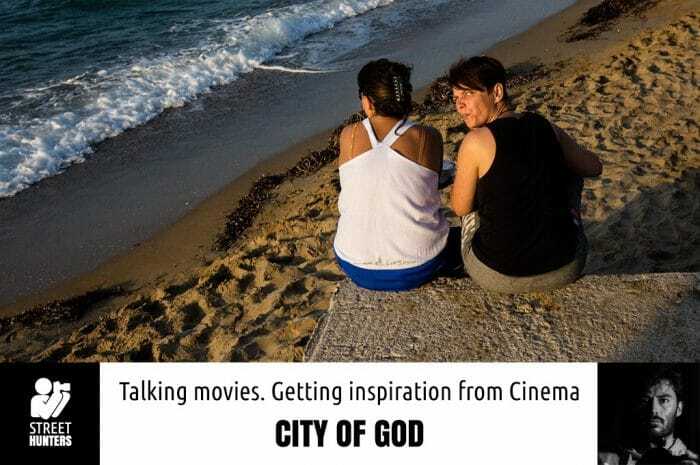 Talking Movies returns for another week, and with this instalment I will be examining the hugely praised Brazilian movie ‘City of God’. 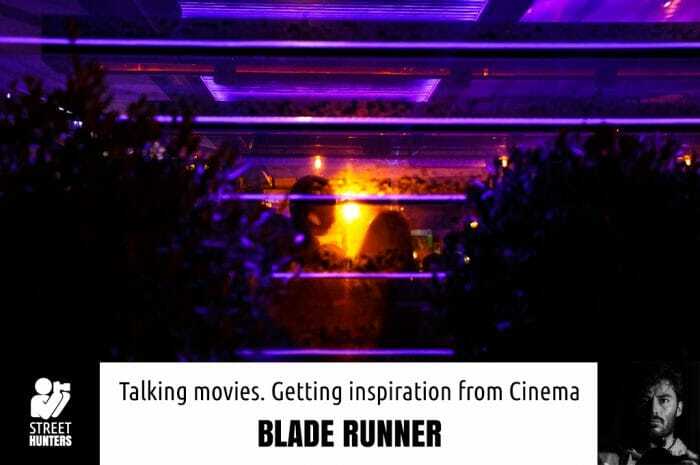 The Talking Movies series shows you how you can get more out of your street photography by studying movies and learning from the composition and lighting effects movie-makers use to make visually arresting art. As usual, I’ll choose three scenes from the movie to look at, and then I’ll show three of my own street photographs to highlight the similarities with the movie and illustrate how cinema has influenced my photography. I’ll also point out differences between my shots and the movie stils, to emphasise how I’m yet to be able to put all the ideas from the movie into practice! Previous instalments of this series can be found on the Talking Movies section of the website. 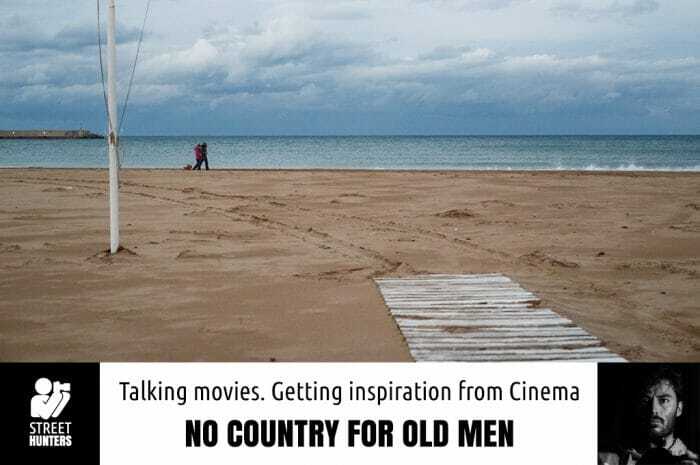 Critically acclaimed motion picture No Country for Old Men is the focus of this week’s instalment of Talking Movies – a guide for how to use cinema to get the best out of your street photography. I have chosen 3 of my favourite scenes from the movie to analyse, and I will explain exactly what it is that I think makes them powerful pieces of imagery. I will then show a selection of my own images and explain how the movie’s style influenced my street photography. 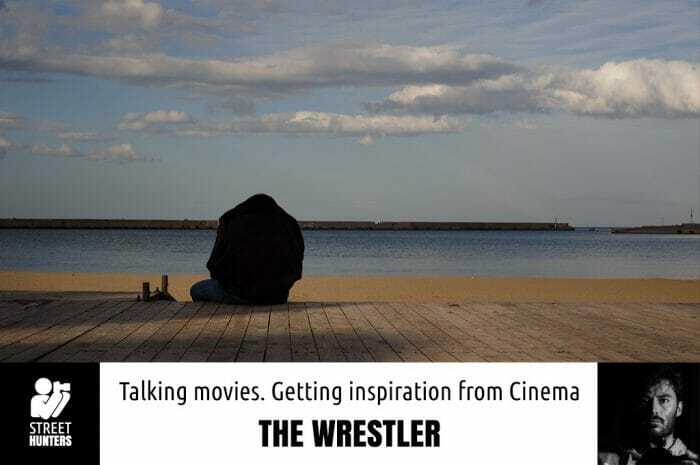 Check out the Talking Movies section of the blog for the previous articles. No Country for Old Men (2007) was adapted from prize-winning author Cormac McCarthy’s 2005 novel by the celebrated directors Joel and Ethan Coen, who also directed the movie. It centres on the discovery of a suitcase full of money by Llewelyn Moss (Josh Brolin) who stumbles across drug deal gone wrong in the wilds of 1980 rural Texas. After taking the money for himself, Moss is pursued by the bloodthirsty psychopath Anton Chigurh (Javier Bardem), who ruthlessly dispatches his victims with aplomb. Following this trail of carnage is local sheriff Ed Tom Bell, played by Tommy Lee Jones. No Country for Old Men was awarded four Oscars, including the much-coveted ‘Motion Picture of the Year’ and ‘Best Director’ gongs, as well as two Golden Globes and two BAFTA wins. Director of Photography Roger Deakins’ was acknowledged with a BAFTA for ‘Best Cinematography’ for his brooding and low-key depiction of the scorched earth of southern Texas and early 1980s Americana. Welcome back to Talking Movies – a guide to how you can use scenes from famous (and not so famous) movies to ignite your creative juices and develop your artistic vision in your street photography. 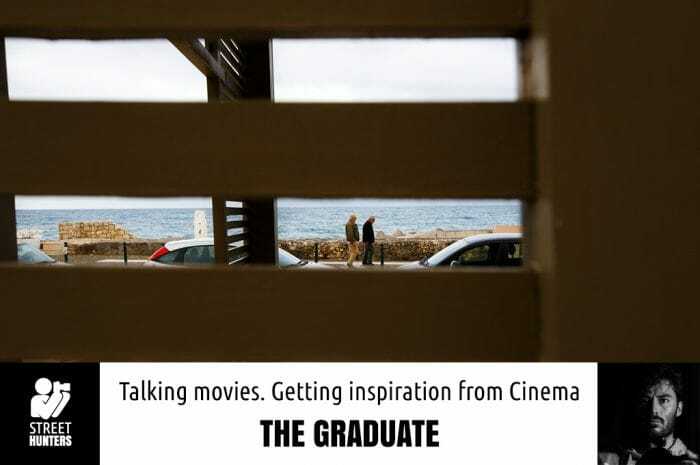 The first instalment of Talking Movies took a trip down memory lane into ‘80s nostalgia with Manhunter, and for this week’s column we’re winding the film spool right back to 1967 and the truly brilliant piece of cinematic storytelling that is ‘The Graduate’. Movies are a great way to take inspiration for your street photography. A truly great movie will be a piece of true escapism for the viewer, as they are immersed wholly in the experience and world the director is presenting them with via the magic of sound and vision. A brilliant movie will leave the viewer with a stream of memorable scenes that will leave a lasting impression. 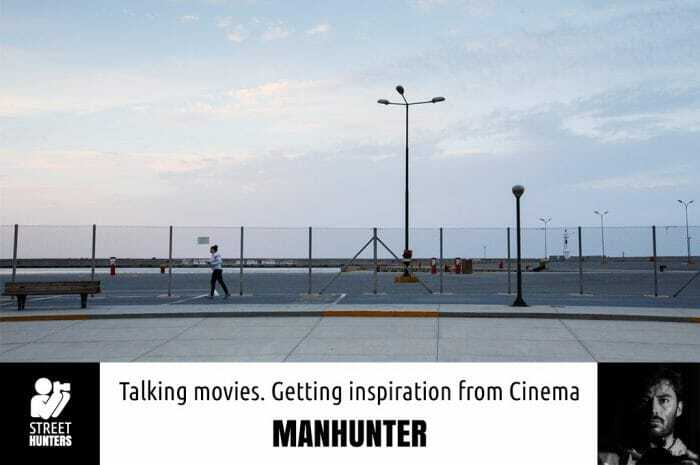 The sheer complexity and cost of movies means that each scene is planned and arranged down to the last detail, and when you watch a well-made movie with a critical photographer’s eye you can start to spot all sorts of hidden details and elements in each shot. With thought and practice you can use what you spot to inform and better your photography. The incredibly fluid nature of street photography means that a street photographer doesn’t have the luxury of time to plan their photos – you need to be able to act fast and instinctively. By improving your visual and artistic literacy through watching and analysing movies you can ensure that your brain remains sharp for when you are able to hit the streets and start shooting.